This story is a case where the everyday world reminded me of the challenges executives face every day, choosing where they will invest their treasure of time and company resources. 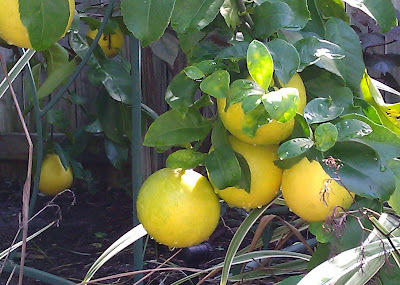 The Meyer lemon tree in our south Florida backyard has rewarded us with a big crop this year, literal low-hanging fruit. The phrase is beloved of vendors and service providers, promising great rewards for doing easy things. Business cases and ROI studies tell us they are going after low-hanging fruit as soon as you give the go-ahead to their project. The heavy lifting you do should move the rest of the fruit lower, not buy you taller ladders. A crucial C-suite mandate is to make things better, not just solve today's problems. If huge chunks of your talent and money are maintaining burdensome legacy processes or technology, your company may stay upright, but you're just buying taller ladders. If you're working to simplify processes, mask complexity, and enable a service-oriented enterprise, you're moving the fruit lower. Where there is fruit, there are windfalls. Let's think of it this way: there are opportunities to find benefits that fall outside the mainstream: to mix metaphors, the long tail of the crop. Is there a corollary business benefit to be gained by letting small teams explore niche opportunities to repurpose other efforts? The ability to think "repurpose" is dramatically helped once you adopt the service-oriented model, which relentlessly standardizes core services to enable greater ease of personalization and micro-customization at the user level. It doesn't all ripen at the same time. Sometimes, you walk away from a classic LHF situation thinking, "yeah, that WAS a high reward for a relatively small effort." In the IT and business world, one of the clearest today is web-based e-mail: necessary but not a competitive advantage, adapts well to mobile and consumer-driven usage. Don't turn away once that's done. The experience of web-based e-mail may enable further benefits from the cloud-sourcing of word processing and other office productivity applications. Can cloud-sourced productivity apps pave the way for "bring your own device" policies and respond to workforce consumerization? On the other hand, should you pick low hanging fruit at all? In 2008 I saw a presentation from a mid-size corporation that had decided to commit to cloud-enabling IT wherever possible. In the slide showing a grid of the applications in the cloud, corporate e-mail was still in the data center. "Why not e-mail?" asked an audience member, "isn't that low-hanging fruit." "Yes," said the CIO, "but our existing e-mail works fine. Why take the time to change it when it's not a problem? We wanted to concentrate on areas where the cloud could make a real difference for us." In other words, just because you can doesn't always mean you should. Web-based mail can make a lot of sense, but in this case, other priorities came first. No matter how easy an opportunity might seem, sound rules of business value cannot be repealed. Do you have a success story of an easy win that came from an unexpected place? How do you maintain focus on long range improvements when there are so many demands to solve problems close at hand? Leave comments, or drop me e-mail.